The work is an expression of family where the father figure's character seems more active and protective. A obra é a expressão da família ,onde a figura do pai parece o personagem mais atuante e protetor. a really fantastic surrealistic work, I like it a lot ! I love the mother's expression. She's happy, very happy as she waves goodbye. wonderful color and expressions Jennifer. I remember how pitiful the kids could look just as you drop them off at daycare, but the minute you left they turned and played merrily with the other kids, as observed through the one way mirror. wonderful work! Very powerful pastel, I love the strong colours! Hi Jennifer, beautiful and expressive artwork ! vraiment très beau Jennifer, j'aime beaucoup les couleurs! Great texture, colors and expressions! I like the colors in this art, Jennifer...and the expression on the man...as if to say, "You expect me to care for all of these by myself?" Amazing art, supurb work !!!!!!!!!! vraiment très beau Jenni, j'aime beaucoup les couleurs! intense and vibrantly alive. it talks to me! Great colors, Jennifer! Hope your week is a great one! De todos los colores, estilos y formas pero todos indicándonos que el tiempo no se detiene (salvo los que están parados). Me gusta mucho la fotografía, el color, la luz y el encuadre. Besos. Absolutely beautiful! Fantastic creative work! Well done, Jennifer! Have a great day! Beautiful Job !!!!!!!!!!!!!! Greetings !!!!! Hi ya Jennifer. Love this. Great colours. 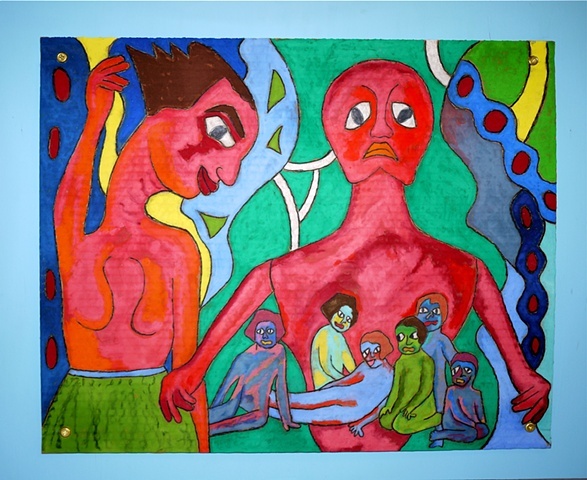 I like the naive-art aspect - interesting composition .. I love the color, and its always so interesting to see the expressions you place on faces of the characters. Top notch art. Wonderful vivid colors...I love it!